The Gorkha National Liberation Front (GNLF) has cancelled a rally that was scheduled to be held in Darjeeling next month in view of the problems supporters might face in spending money to come to the event in the aftermath of the demonetisation drive. Travelling in the hills is expensive. Moreover, sources said the expenditure that needed to be made to organise a rally could also have weighed on the minds of the GNLF leaders. "Our party is not flush with funds. We depend on our supporters to come to meetings by spending their own money. In the current situation, it would be a tall task for the common people to attend the meeting," GNLF spokesperson Neeraj Zimba said today. Party leaders said they had instructed cadres to organise low-key events in their respective constituencies on December 6, when the rally was supposed to be held, to mark the signing of the memorandum of settlement for including the hills in the Sixth Schedule of the Constitution. The agreement was signed by the state, the GNLF and the Centre in 2005. Political parties have to spend considerable amounts on setting up stages, installing sound systems and hiring chairs and other items for rallies. Sources said that because of the cash crisis precipitated by the demonetisation of the existing Rs 500 and Rs 1,000 notes, paying for these items might be difficult. 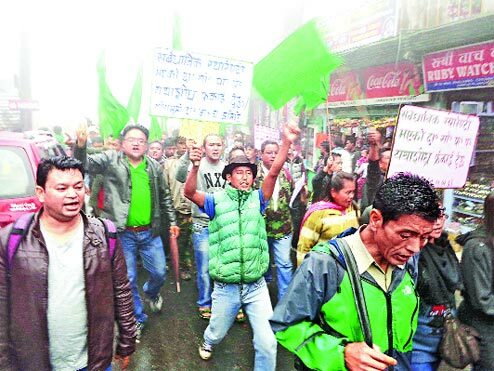 The GNLF was supposed to hold the December 6 meeting at Darjeeling Motor Stand. Party spokesperson Zimba said: "The GNLF is considered the second largest party in the hills and we have to ensure a good footfall at the meeting. We had planned a public meeting at Darjeeling Motor Stand to mark the Sixth Schedule Accord day on December 6. Recently, we held a central committee meeting and after analysing the situation, we are of the opinion that we cannot hold the meeting on the specified date because of the demonetisation problem." He added: "This is the only reason why we have cancelled the meeting. A new date has not been finalised." The Trinamul Congress, which is scheduled to hold a rally at Darjeeling Motor Stand on November 27, has not announced any changes to the event. The Gorkha Janmukti Morcha, on the other hand, has postponed some of its events. The hill party has not cited any reason for the change in plan. Trinamul spokesperson N.B. Khawash said: "As of now, the meeting will be held as scheduled, but we will make the final announcement in the next two or three days. Since state-level leaders are expected to attend the meeting, the final call will be taken after consulting them." Asked about party programmes, Morcha general secretary Roshan Giri said: "The November 20 meeting (at Kurseong) has been postponed to November 27. We were supposed to hold a public meeting in Darjeeling on November 27. Now, it will be held on December 4. The December 4 meeting, which was scheduled at Sukna, will be held after our Delhi dharna."